The concept of infinity can be explained in the simplest terms as something with no bounds, larger than anything, and featuring every combination of all things possible. Now what does any of this really mean? The most basic way to explain Infinity is to consider how it is represented in math and then apply that to something less abstract, less basic. In math Infinity is shown to be an endless stream of numbers in each direction (Increasing positives & increasing negatives). This means that behind every positive number there will be a larger positive number each time, regardless of how far you go. Even if you reach the largest number you can continue if you imagine the same number and add one. Same goes for negative numbers, simply subtract one. In the case of geometry, imagine an XY grid and set four points to equal a perfect square. Then along the Y axis stretch the length of the square to be just one set of points greater than the top of the grid itself. In other words, draw the square so we do not see the top two points, effectively turning the square into a rectangle with its top too high to see on the grid. Make the bottom two points infinite as well and the same principals apply. Stretch downwards forever the lowest two points leaving on the grid just a pair of parallel lines shooting from top to the bottom. Now the entire Y axis is infinite and as a result too big to even imagine, thus it cannot be represented visually. 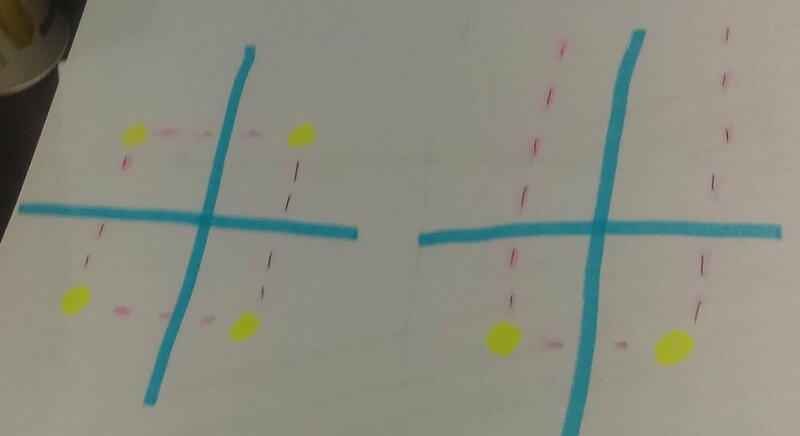 In order to make the X axis also infinite, simply pull the parallel lines off the grid in their respective directions. In our understanding of reality infinity shows itself many different ways and in seemingly everything, but it’s much more complex than we can expect to understand, so the best we have are examples to convey the general idea of infinity. I’ll elaborate on some. Imagine you have a telescope. You are standing out in a large field empty of all light pollution and you can see our galaxy, our stars high above, spiraling their slow dance overhead. Now imagine your telescope has infinite zoom to see as far into our universe as you’d like. Initially, when you start zooming in you’ll see all nearby things in our star system. First the moon. Then mars. Eventually a meteor belt, the tail planets, an outer shell meteor belt, and finally you are outside of our star system. Now you are traveling between stars, you’ve reached interstellar space with the telescope and you continue to increase magnification and see farther and farther. All the stars in our galaxy are past, all the black holes, and all the nebula and eventually you exit the gravitational pull of the supermassive black hole at the center of our galaxy keeping it together. Now, you’ve reached the space between galaxies, intergalactic space. Intergalactic space is where infinity comes into play. Imagine you increase magnification farther and see only more galaxies. And magnification keeps increasing, and you see it increasing and looking farther and farther and farther, more and more galaxies rushing by, but there seems to be no other side. And however long you sit there and increase magnification you'll continue to see nothing but more galaxies. The same can be applied to using a microscope. Imagine a microscope which could see infinitely small if desired and start increasing magnification. Aim, let’s say, at a person’s body and begin. We first arrive at their skin, we get closer and it appears scalier and blurs out to form individual cells, which blur out to reveal the atoms forming the cell, which blur out to reveal the electrons, protons and neutrons of the atom, which blur out to reveal quarks, and the Higgs boson particle, and eventually vibrating strings. We’ve now zoomed in to the basic strings which form all of perception as expressed in String Theory. The most basic thing in the universe. To apply infinity in this instant, pretend to magnify onto an individual string, and assume it blurs out to form two or more other things. And when you focus on these new fundamental pieces of reality, you find yet another thing being the source of its existence. Continue this for all of time. And then keep going, and you’ve zoomed in infinitely. In theology infinity is as simple as asking: Does God question whether or not their existence is by intelligent design or random chance? And if it is by Intelligent Design, does that creator then question their own existence too? How many times can this happen before without a doubt there is no other way to pose the same question rationally? In the case of the big bang, the same principal as theology can be applied. Simply ask what came before. The big bag is an explosion? What came before that? It’s within the multiverse where it happens infinitely? What came before the multiverse? An ultraverse with infinite multiverses within? Okay, what came before that? This pattern could be followed forever making the scenarios themselves infinite as well as the string of questions which has no end. In the case of matter, infinity means in a quite literal sense that every possibility of everything must take place in the universe as we know it. Let us start, with a simple pillow and attempt to picture an infinite number of pillows. The first pillow is normal by pillow standards. It’s a pillow made of feathers, let’s say. Its average length and average width and average high. It’s been around for an average amount of time. Now imagine there is an identical pillow with the slight difference that it has a foam fabric on the inside rather than feathers. Now imagine a third only slightly different from the second, in which instead of being average sized, it’s slightly bigger than the previous. Continue this for as long as you’d like changing any one category to anything possible within the given perimeters and the possibilities are endless. Maybe one of the pillows hasn’t been around a normal amount of time, maybe it is a million year old pillow. Maybe one has always existed and never didn’t exist. Maybe one of them is infinitely big and made of space dust. Maybe one just like that pillow developed life on planets created by identical space dust. In the case of infinite probabilities the case of an Infinite universe or infinite multiverse come into play. If the universe stretches on forever, matter should combine an infinite number of ways through that infinite space. Meaning, you travel long enough, eventually you might begin to see the same things, because matter just lined up identically. Theoretically, this means somewhere out in space, far enough for all the combinations of a certain amount of matter to occur and repeat, you could eventually find a place where matter would align in such a way that there is someone who looks identical to you, on a planet also named earth, and their name is the same as your own, and their life story is identical to yours, but its only that matter lined up this way and not that it is in fact you. Matter has a limited set of combinations if the matter is limited, and with infinite space to execute all combinations, repetition will occur. In fact, there should, under the concept of infinite universe, be an infinite number of identically arranged sets of matter that equal life identical to yours except there isn’t a person equal to you there. There should also be an infinite number of nearly identical version with slightly different variation in choices, or greater variations. Maybe one version of you is a doctor and in the other a mechanic, but ultimately all other events remain the same. Maybe all events occur differently in the life of someone who looks identical and shares an identical name. There should also be an infinite number of times nothing can form from matter for an infinite amount of space. All these same principals apply to the universe being limited within an infinite multiverse, because this means the amount of matter in any given universe is limited, and applied to an infinite number of occurring alternatives and similarities, there will be identical and completely dissimilar universes within the multiverse. In the film the matrix, the main character Neo realizes the life he understood to be taking place was no more than a simulation and he disconnects into the “true reality” outside the program his illusion life was based in. Imagine what Neo believes he connected to is no more than a simulation run by scientists wondering the probability that someone in a simulation would try to escape. This means the simulation he was in was created within the simulation the doctors created. Thus, the reality Neo sees when he “disconnects” is also just another simulation. Continue and imagine those scientists are in a simulations where the purpose is to see whether or not virtual scientists would create simulations out of curiosity. Repeat this forever, and everything is simulated without the inclusion of some infinitely far and unreachable base reality. Infinity is complex. It’s difficult to understand, and please don’t take these visualizations as a claim that I do, because I do not. Infinity is too complex for the human mind to comprehend so we do the best we can to express the intricate complexities of such a concept. I simply hope this helps understand it more, although fully is impossible.